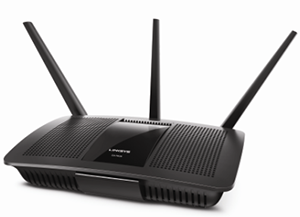 The Linksys EA7500 Max-Stream™ AC1900 MU-MIMO Gigabit Wi-Fi Router is an MU-MIMO Ready Dual-Band router with two (2) USB ports (1x USB 3.0 port and 1x USB 2.0 port). 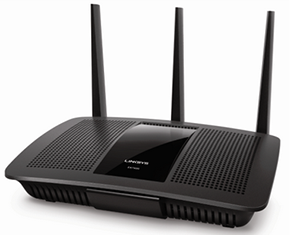 It supports a maximum speed of 600 Mbps on the 2.4 GHz band and up to 1300 Mbps on the 5 GHz band. 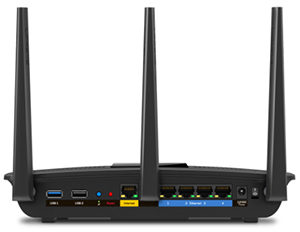 This router comes with three (3) external detachable dual-band dipole antennas for enhanced dual-band communication, better coverage, and range. 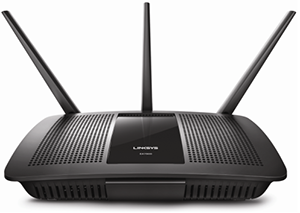 The Linksys EA7500 has Beamforming technology on both bands which helps improve the quality of voice, streaming of video, and other bandwidth and latency sensitive transmissions. With this technology, more data reaches the targeted device instead of radiating out into the atmosphere since Beamforming-supported devices focus their signal toward each client. You can increase throughput and range by using multiple antennas in which data is sent and received. Adjustable antenna ports - The three (3) adjustable external antennas should be connected to the router before powering it ON. To connect the antennas, twist the antenna connectors clockwise onto the port. Multi-Story homes - Position the antennas where the middle antenna is straight up and the side antennas are angled outwards (30°-45°). Single-Story homes - All three (3) antennas are positioned straight up. USB1 Port (USB 3.0) and USB2 Port (USB 2.0) – Connect your hard disks or flash drive into these ports. This supports FAT, FAT32, NTFS and HFS+ journaled and non-journaled file system. Wi-Fi Protected Setup™ (WPS) button - If you have client devices, such as wireless printers that support Wi-Fi Protected Setup™, you can press the WPS button to automatically configure wireless security for your wireless network. To know how to connect devices using the WPS feature, click here. Reset - This button allows you to reset the router to its factory defaults. Press and hold the Reset button for approximately 10 seconds. Internet (Yellow/Green) - Using an Ethernet cable, the Internet port connects the router to your Internet connection, which is typically a Cable or Digital Subscriber Line (DSL) modem. Ethernet / LAN 1-4 (Yellow/Green) - These Ethernet ports connect the router to computers and other devices on your wired network using Ethernet cables. Power port - The power port connects to the power adapter that comes with your router.